The bad news is that we have already passed into a dangerous range of atmospheric carbon dioxide. The good news is that if we act smart and promptly it is still feasible to achieve a safe level of atmospheric gases, and the actions needed to achieve that would have multiple benefits in addition to climate stability. 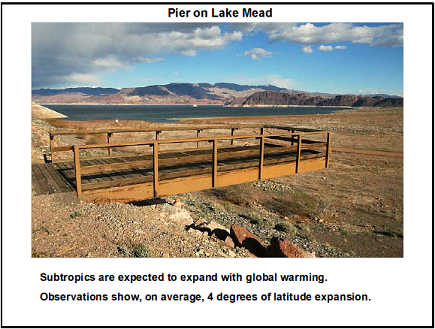 Here are several climate tipping points of special concern. Tipping points are “non-linear” phenomena, which means that they can reach a point at which rapid catastrophic change occurs. The mechanism that seems to be most important for disintegration of the great ice sheets that cover Antarctica and Greenland begins with ocean warming. Ocean warming leads to melting of ice shelves, which are tongues of ice that stretch out into the ocean. The ice shelves buttress the ice sheets, so when ice shelves disappear the more mobile parts of the ice sheet, the ice streams, can surge into the ocean – thus removal of the ice shelves is somewhat akin to taking the cork out of a bottle – it allows the material behind to flow rapidly. We know from Earth’s history that once ice sheet disintegration is well underway, sea level can rise by several meters per century. Species extermination is also a non-linear problem. Today we are placing many species under multiple stresses, but one stress that is growing rapidly is the shifting of climate zones due to global warming. An average temperature line has been moving poleward at a rate of 50-75 kilometers per decade during the past three decades. As the total movement of climate zones becomes larger it threatens those species that are less mobile. Because of interdependencies of species, the loss of key species can cause entire ecosystems to collapse. Methane is an especially powerful greenhouse gas. There are large amounts of methane presently locked up, frozen, in high latitude tundra and, especially, in ocean sediments on continental shelves. We know from Earth’s history that this frozen methane can be released suddenly by sufficient warming – thus this methane has the potential to greatly amplify human-made global warming, if that warming reaches a level, a tipping point, such that large volumes of frozen methane begin to melt. The meltwater runs to a low spot on the ice surface, where it burrows a hole in the ice sheet that carries the water all the way to base of the ice sheet. 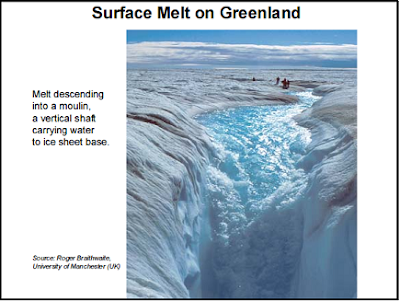 The meltwater lubricates the base of the ice sheet, accelerating the discharge of giant icebergs to the ocean. 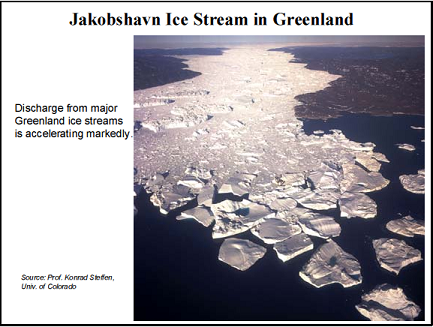 This is one of the processes causing ice loss from Greenland and Antarctica to increase. Another process, probably even more effective than surface melt, is melting of ice shelves by warmer ocean water. Ice shelves are tongues of ice extending from the large ice sheets into the ocean. The ice shelves buttress the large ice sheet, helping to keep it in place. As a warming ocean melts the ice shelves, icebergs begin to stream more rapidly into the ocean. Until recently, some scientists argued that global warming may cause ice sheets to grow, because a warmer atmosphere holds more water vapor and thus produces greater winter snowfall. Of course, common sense suggests that the ice sheets will become smaller as the planet becomes warmer, but accurate measurements are needed to prove what is happening. Beginning in 2002 precise measurements of Earth’s gravitational field were made by the NASA GRACE satellite. 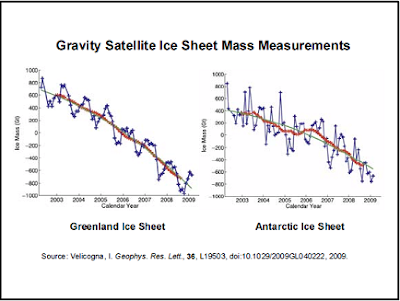 The gravity data yield accurate measurements of changes of the mass of the ice sheets. As the figure shows, the mass of Greenland increases with winter snowfall and decreases with summer snow melt. 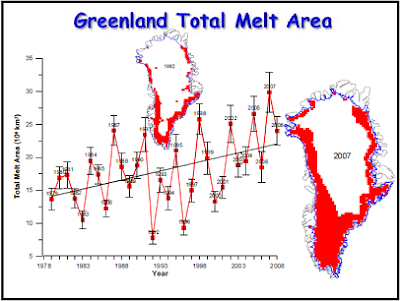 Overall, Greenland is losing mass at a substantial rate. Earlier this decade Greenland was losing mass at a rate of nearly 200 Gigatons per year. In the past few years the mass loss has increased to almost 300 Gigatons per year. One gigaton is the mass of one cubic kilometer of water. The status of the Antarctic ice sheet is even more important. The West Antarctic ice sheet is vulnerable to possible rapid disintegration, because much of that ice sheet is grounded on bedrock well below sea level – so a warming ocean could potentially dislodge the West Antarctic ice more readily than ice that is sitting on land above sea level. The West Antarctic ice sheet contains enough ice to raise sea level by about seven meters. The right side of the figure shows that Antarctica overall is losing ice mass. In the past few years the rate of Antarctic mass loss has increased, with the recent rate being close to 200 cubic kilometers per year. Earth’s history reveals numerous cases in which ice melt caused sea level to rise several meters per century. If business-as-usual greenhouse gas emissions continue the human-made climate forcing will be much greater than the natural forcings that caused these earlier ice sheet disintegrations. I find it implausible that the West Antarctic ice sheet could survive this century, if business-as-usual emissions continue. Thus, in such an emission scenario, sea level rise of several meters should be expected this century, with still further sea level rise continuing, out of control of humanity. Arctic sea ice is another potential tipping point of the climate system. 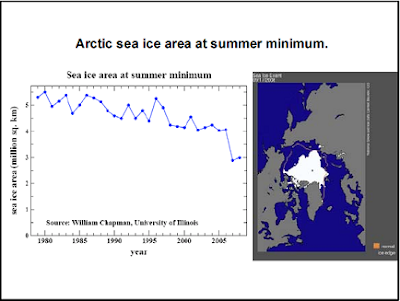 The area of sea ice at the end of the summer began to be measured accurately from satellites in the late 1970s. The graph shows that the area of sea ice fluctuates from year to year, based on variable weather patterns. However, overall there has been a decline in sea ice area over the past three decades. In 2007 there was a sharp decline of sea ice area, to an amount just over half of the ice area three decades earlier. Although sea ice recovered slightly in 2008 and even more in 2009, most analyses indicate that all summer sea ice will be lost within the next few decades, if business-as-usual greenhouse gas increases continue. It is difficult to imagine that the Greenland ice sheet could survive, if the Arctic sea ice disappears in summer. Stabilization of Arctic sea ice requires, to first approximation, that Earth’s energy balance is restored. At present, because human-made greenhouse gases have reduced the amount of heat radiation that Earth is emitting to space, the planet is out of energy balance by about 0.5 watts per square meter, uncertain by about 0.25 watts per square meter. Other things being equal, the amount of carbon dioxide in the air would need to be reduced from its present 387 ppm (parts per million) to about 350 ppm in order to increase emission of heat radiation to space by 0.5 watts per square meter and restore Earth’s energy balance. An important practical impact of global warming is the shifting of climate zones. The atmosphere’s average overturning circulation, with rising motions in the tropics and sinking air that forms dry subtropical belts in both hemispheres, is expected to expand as the planet becomes warmer. Observations show that the subtropics have already expanded poleward, on average, by about four degrees of latitude. Expansion and intensification of subtropical regions is already noticeably affecting the southern United States, where Lake Powell and Lake Mead are now only about half full, and the Mediterranean region. In the Southern Hemisphere, Australia and parts of Africa are affected. One effect of increasing climate extremes is an increase in the frequency and intensity of wildfires. 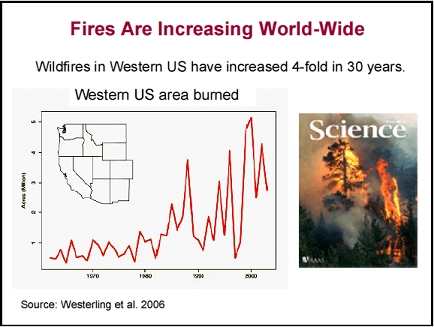 In the western United States, wildfires have increased four-fold during the rapid warming of the past 30 years. 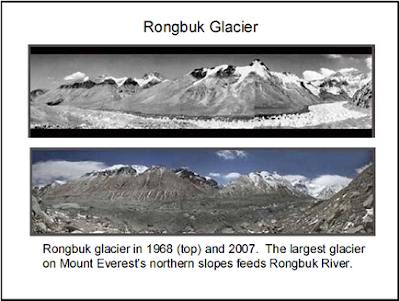 Mountain glaciers are melting rapidly all over the world. If we continue with business-as-usual, most glaciers will disappear entirely within 50 years. The loss of glaciers has great practical impact. Seasonal melting of glaciers provides fresh water for billions of people, storing water during the winter and releasing it slowly in warm seasons. During the dry season more than half of the water in great rivers such as the Ganges and Brahmaputra is meltwater from glaciers. Once the glaciers are gone, melting of increasingly large winter snowfall will cause great spring floods, but the rivers will run dry in the seasons when water is most needed.